The ¥12,000 (£95) Onpitsu looks rather like a fat magic marker but the built-in speaker gives it away for the sophisticated audio player it really is. Learners of, for example, Japanese with its complex character system, get an audio readout of the printed word by pointing the Onpitsu at text in a specially formatted book. 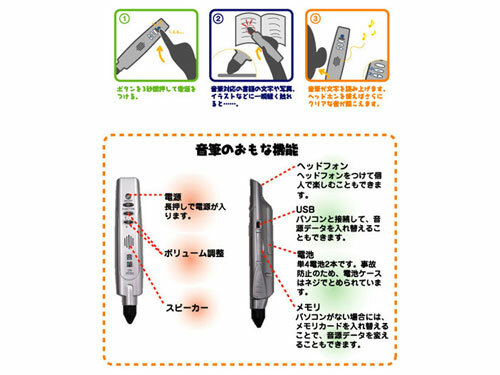 It might sound like a minor aid but the ability to touch the Onpitsu’s scanner-equipped tip to a page and hear the correct pronunciation of text in a strange script can save hours of hunting through dictionaries. Books and their accompanying audio files on proprietary memory cards for Onpitsu (a combination of the Japanese words for ‘sound’ and ‘pencil’) are already available from several major publishing firms. The device also has 256MB of onboard memory and can connect to a PC by USB to receive the free audio downloads supplied by some more innovative magazines. Given the popular Japanese-learning method preferred by some of us of spending endless nights in Tokyo bars, perhaps Imajinsha’s next product will be an audio-equipped sake cup.